Just following Jesus in my real life...: On my kitchen windowsill..
so I bought the old mincemeat jar for a couple of dollars at Monticello Antique Marketplace. 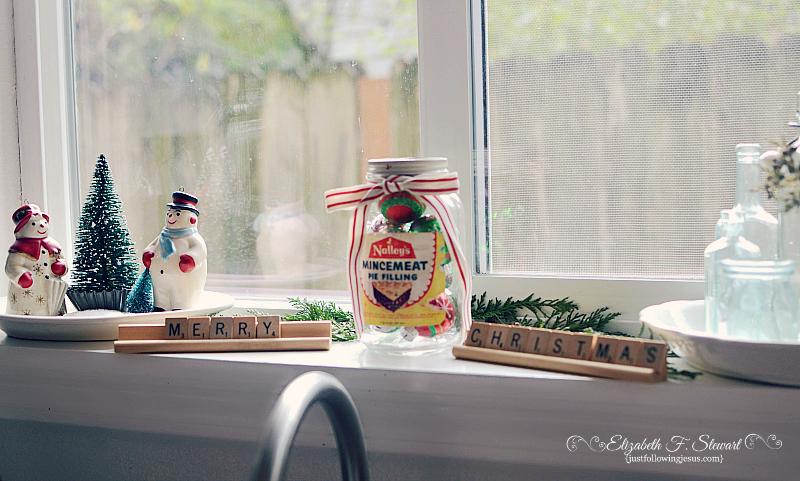 I filled it with small, shiny ornaments and set it on my kitchen windowsill. 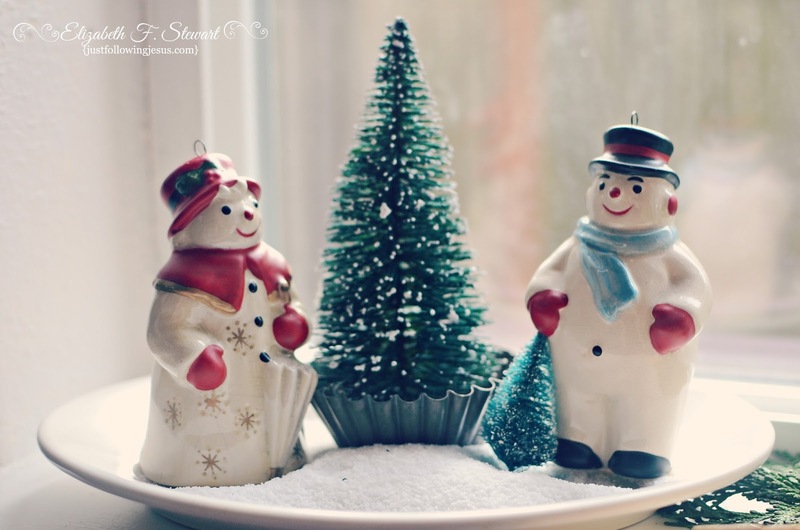 Mama bought me these little snowman ornaments some years ago. She was not one to spend money on things that weren't necessities. I love them, because for her to buy me something with no practical purpose was such a rarity. This year, my kitchen windowsill is filled with things that remind me of Mama. It makes me smile, too! 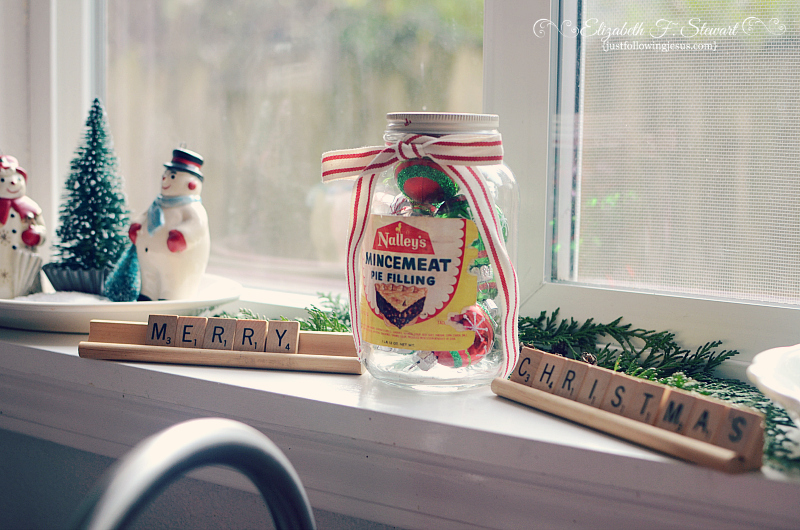 That mincemeat jar is so cute. My mom always made my dad a mincemeat pie at Christmastime. It was such a treat for him but no one else liked it so he got to eat the whole thing - until I met my sweetheart. Then my dad had to share with him! Your window is absolutely darling. I still have to start decorating. You've inspired me to get going. I will share a mincemeat cookie bar recipe with you. You can half it and make it for your hubs as a special treat! That's not silly at all. What a sweet place to remind you of your mama. I pull out my Christmas tree skirt that my grandmama made for me every year. I will use it for as long as I'm living. It's been part of our Christmas decorations for 30 years now. That is such a special momento! We have a running mincemeat pie joke in our family which wouldn't be funny to anyone except our family. When I saw that jar, I got a case of the smiles. 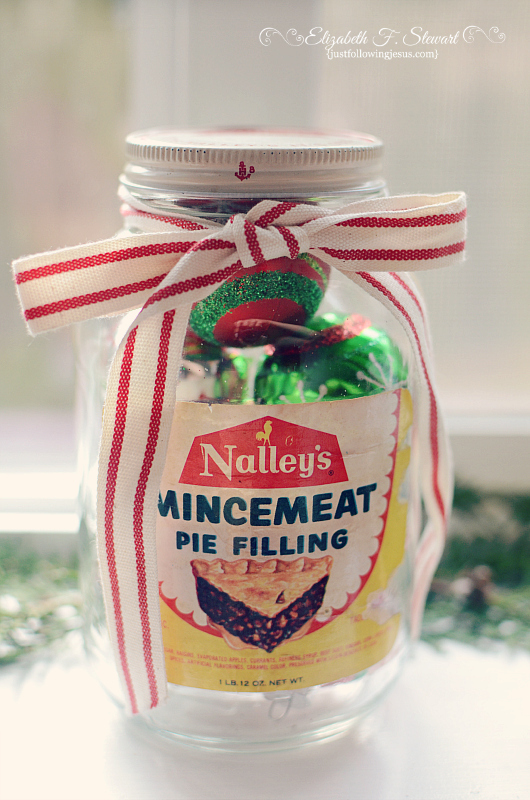 My mother loves mincemeat, and a jar like that would evermore remind me of her like it does your mom. I love sweet things like that. Debbie, we all are mincemeat lovers in our family. It's definitely one of those either you love it or you hate it type of foods. I loved my mom's mincemeat pies...but she usually used homemade canned mincemeat. I haven't had any since she passed away--more than 20 years...and if I were to try to make one, I would have to eat the whole thing--my hubby and kids and spouses wouldn't touch it! I love old things that evoke pleasant memories! I will share a recipe for mincemeat cookie bars on my blog so check back in later in the month! Mom also made mincemeat cookies, which were my one nephew's favorite...I wonder if they taste something like your cookie bars? Can't wait to see your recipe...maybe I will dig out my mom's cookie recipe and compare. That is a most precious sill right down to the Scrabble Letters! I love old memories & the jar is such a sweet reminder of days passed. Blessings! Thank you so much. I craved simple this year, so all my decor is rather homespun and simple. My family all loves mincemeat thanks to my Mama and Mother-in-law who both made yummy treats with it. Like you, I no longer have my sweet mama here on earth with me. I find that surrounding myself with things that evoke her memory especially during the Holidays bring her close again. It also allows others to share in the precious memories. Thank you for sharing your memories with us here! The holidays definitely bring up memories of Mama and make me miss her more. Bless you as you remember your mama as well, Krista! I love the simplicity of how you do life. I smile every time I come to read and see what you are doing. So blessed. Makes me smile too. So glad you have those reminders from her.